If you’ve spent much time using OS X Lion’s new LaunchPad feature you’ve probably noticed that outside of stuffing things into new folders you can’t really hide apps. If you enter the ‘jiggle‘ mode and try to remove an app from LaunchPad, it actually uninstalls the app, which makes it very easy to uninstall things but not so easy to customize your LaunchPad experience. But now there’s LaunchControl, a free utility that allows you to hide any app from appearing in LaunchPad without uninstalling the app from Lion. LaunchControl is a tiny download and extremely easy to use, it displays a list of all the apps contained within your LaunchPad and you just uncheck the ones you don’t want to see anymore. This is a great addition to any Mac running Mac OS X Lion, and it really helps to reduce the LaunchPad clutter that some software packages like Adobe Creative Suite and Microsoft Office dump into the LaunchPad. I would bet that in time Apple will introduce a native feature to Lion that has a similar function because this is just too useful, but until that time comes, LaunchPad-Control is highly recommended. Hat tip to MacStories for finding this great little app, they point out that it’s donationware so if you like the app then throw the developer a bone to encourage them to put out more useful tools. Update: The developer has issued an update that turns LaunchControl into a System Preferences panel instead of an app. replace app_name with how it shows in launchpad and you are done. and yes, sqlite is preinstalled in lion you don’t need Xcode for it to work. i find it odd they use sql rather than a simple plist as usual, but that gives you an idea where apple is heading with ios and macos doesn’t it? If you delete them manually and they still show up you just need to trash the .db files in ~/Library/Application Support/Dock/ and then killall Dock to force a refresh of the entire LaunchPad contents. It will respawn good as new but lose your custom placement and folders. Can anyone send me the prefPane file? Seems the original link is dead, and so is the whole domain. Launchpad is a mess. I suspect Apple will release a patch to fix it soon, because currently, I don’t know anyone who can operate it with 100% functionality. I can’t remove certain groups. I can’t remove certain apps from these groups or move them to a different group. New apps automatically show up on screen 2, even though there’s plenty of room. I can’t figure out how to adjust the icon size. I can’t rename certain groups. Not all apps show an “X” in jiggle mode. Obviously, I can’t make full use of it until this stuff is cleared up. Hope that LaunchPad-Control will help wrangle some of these oddities. I agree they need to update this quickly because it’s buggy. 10.7.1 hopefully. thnx Xf… i did place a lot of apps in folders so i could trim the lot down to ‘2 pages’ but with your suggestion it could make things more simple. Than again, all i care about is that i have the ability to remove certain ‘uninstall apps’ like lexmark of freaking Adobe Flash uninstallers. With these tips i can ‘hide’ them from the Launcher and THAT i appreciate! It’s bad design if we need to install an app to just hide icons… it’s frustrating… although saying that, I think I’ve used launchpad about twice. Once to rearrange icons, and once by accident. It’s pointless. It seem te be useful apps. Apple keeps trying to shove stuff down our throats. To me they are trying to dumb down the computer instead of enhancing it. It has been reduced to a video playing, music playing, and game playing toy. They make it so the absolute idiot can work it, and yet it becomes a lesser machine for those you still want a computer to do wonderful things. The funny thing is that Windows 7 is trying to be like Apple with their version of the dock, and launch pad simply looks like Windows XP. All short cut icons on the desktop. That is a little strange. The LaunchPad also makes it easier to delete apps by mistake, instead of deleting shortcuts like XP, Vista, and W7. Apple wants to control the way you use your computer, instead of the user, or customer controlling it. I love Apple and their products, BUT I think they are going backwards instead of forwards now. I want a computer, not a big iPad, or iPhone!!! And … I sure don’t want Apple storing my stuff on their Cloud. They have a habit of killing online services as they are with Mobile Me, so all those people who put years writing a blog, and have accumulated followers will be left in the dust. For a company who has proven one of the best in customer service, I would say they are letting customers down with that one. We are not all idiots Apple. Some of us do think different still. 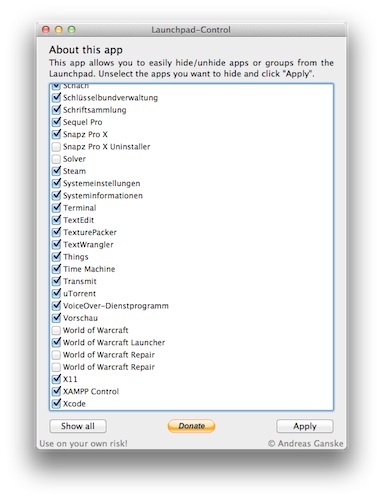 When I hide adobe uninstallers from louncpad list they come back again – now I have 3 hidden sets of the same adobe uninstallers… what should I do? 1. Launchpad appears to come with two pages, but it will create another page if you drag an icon to the right edge of the screen. Wait a second, and then the page scrolls into view. I hide my unwanted apps on the last page. 2. Similarly, you can move icons between pages by dragging them to either right or left edge of the screen. 3. As mentioned, groups are created by dropping one icon on top of another. If you don’t like the auto-assigned group name, edit the name by opening the group and then clicking on the group name. I am not sure how much I will use Launchpad. It seems that with apps properly arranged, it might be a convenient addition to the dock or Spotlight search. > still want a computer to do wonderful things. I don’t believe this statement is supportable. I do not feel they are forcing it upon me, nor is my MBP a lesser machine because it comes with Launchpad. Rather, Apple appears to be experimenting with a new UI which I can either take or leave. If Launchpad makes it easier for my mom to use her Mac, then kudos to Apple. 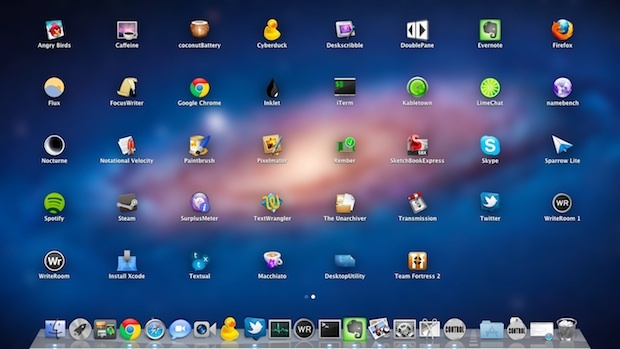 Launchpad is similar to their much older Launcher (System 7), but is easier to use and looks a lot nicer. Launcher was also optional. Launchpad Control is a mess too! Just about the time I think it’s the way I want it, It crashes and removes all apps. Hopefully Apple with address this mess. Thanks. Really helpful to this mac newbie.